You have Advance 2010 installed on your computer and the Advance 2010 license activated. 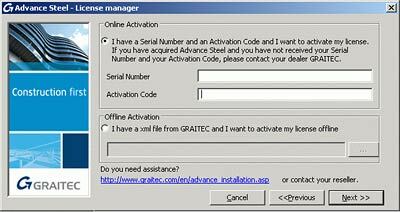 Being under maintenance, you have received the 2011 DVD package and the entitlement for 2011 by e-mail from GRAITEC and you would like to start using the new version. The 2010 license was activated based on a Serial Number and Activation Code. A new Activation Code which authorizes you to use the same features, for Advance 2011. 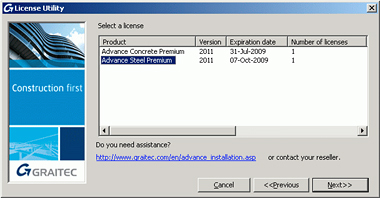 (If you have Advance Steel Professional 2010, you will receive an Activation Code for Advance Steel Professional 2011). Since the Serial Number is unique, as long as the Advance 2010 license is active, you will not be able to activate the 2011 license. 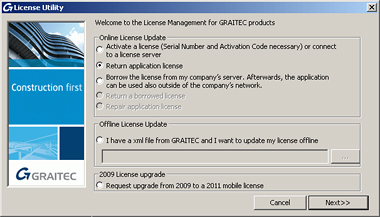 You must return the 2010 license to the GRAITEC License Server, and then activate the 2011 license using the Activation Code you received. The 2011 license allows you to use Advance 2011 and Advance 2010. 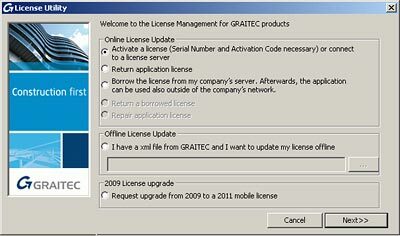 The Advance 2010 license must be returned to GRAITEC License Server before activating the new 2011 license. Advance 2010 and Advance 2011 can both be used with the Advance 2011 license. There will be no missing functionalities in Advance 2010 due to the usage of the Advance 2011 license. 1. Install the 2011 release (see the Installation guide - p. 10). 2. Return the 2010 license (see Returning a license or see the Installation guide - p. 22). You can use Advance 2010 and Advance 2011 on the same computer. If you did not return the 2010 license, you will get the following error message. 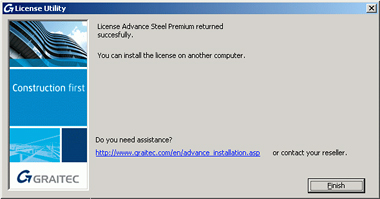 The user purchased or received an Advance 2010 license. The user activated the 2010 license. Since the 2010 license is still active, the quantity of available licenses is 0. The license is unique. If the user tries to activate the new license, an error message is displayed. The user returns the 2010 license. The license is available and can be used based on the Activation code for Advance 2011. The user activates the 2011 license. Before starting, close the active Advance sessions. In the License Utility dialog box, select Activate a license. Click twice on Next.